The comedy of insult dominates this two-hour tribute. Host Dean Martin heads the list of 20 celebrities, including Gene Kelly-who shows clips of Sinatra and himself singing and dancing in "Anchors Aweigh" (1945), "On the Town" (1949) and Take Me Out to the Ball Game" (1949); Peter Falk, who does a routine as Columbo; Ruth Buzzi, who appears as her "Laugh-In" character Gladys, the "president of the first Frank Sinatra fan club"; and Jonathan Winters as Elwood Suggins, "the bus driver on Sinatra's concert tours." 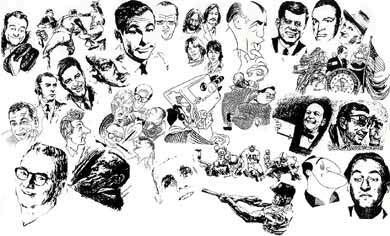 Also: stand-up spots by former California governor Ronald Reagan, George Burns, James Stewart, Milton Berle, Redd Foxx, Flip Wilson, Dom DeLuise, Charlie Callas, Telly Savalas, LaWanda Page, Orson Welles, Don Rickles, Red Buttons, Rich Little, Jack Klugman and Ernest Borgnine.